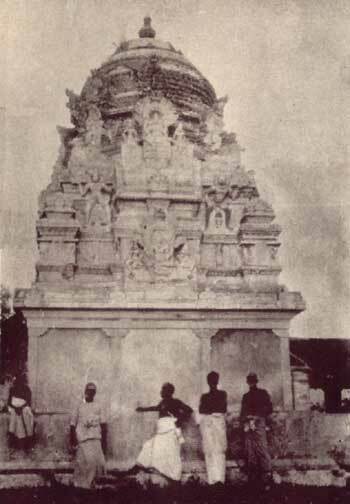 Photo of Tiruketeeswaram temple taken in the early 1930's. Tiruketeeswaram, near Mannar, is the sthalam where thousands gather on Shivaratri night for veneration of Lord Shiva. They perform their sin dispelling ablutionary teertham baths in the sacred waters of Pal Teertham, the following morning. The location became hallowed from the mythological era for it was here that Ketu Bhagavan performed tapas and obtained the benign vision of Lord Parameswara and Ambal Devi; hence the site became known as "Tiru-Ketu-Ishwaram". It is said that the Sage Agasthiya Maha Munivar, in his pilgrimage to Shiva sthalams in the South, paid homage at Tiruketeeswaram also before proceeding to Dakshina Kailash (Koneshwaram). Matotta (or Matoddam), the celebrated city that Maha Tuwadda pounded became a great Sea Port and marketing centre of world renown. Babylonians. Egyptians,Greeks, Chinese and Japanese bartered their goods at Matotta. Tiruketeeswaram Temple received much support. The Pallava era, which created a magnificent temple at Koneshwaram, created an upsurge of Hinduism in the country, from about the 5th century. It was then that Saint Tirugnana Sambandhar and later Saint Sundarar each offered a patikam of Tevaram verses to the Lord of Tiruketeeswaram. These are precious verses that are recited by every Hindu, almost daily.  The Chola dynasty ruled over all of Ceylon for 72 years in the 10th century; their activities were mostly at Polonnaruwa, their capital city and in the Trincomalee region. A temple with the name of Veera Rameswaram was erected here during the regime of Sundara Pandiyan, in the 13th century. With the silting up of the Gulf of Mannar by Manal Aar (Malwattu Oya), and the discovery of the mariner's compass which made navigation in mid-ocean possible, the fortunes of Matoddam as a sea port declined (and was never regained). Finally, with the advent of the Portuguese in Mannar and the consequent warfare, all pujas terminated at Tiruketeeswaram Temple in 1589. The Portuguese Governor was seen supervising the transport of the temple stones for building the Mannar Fort. After a lapse of over four hundred years, Arumuga Navalar, who urged the people to rebuild the temple, revived the subject. An effort was made during the early years of the century and a small shrine was built in 1910. With the restoration of the ancient Palavi Teertham in 1949, a major effort was made and a proper temple was completed in 1976. Teertha Kavadi is a special ritual here. To be permitted to perform linga abishekam is the greatest aspiration of any pious Hindu. This is possible only in Kasi and Tiruketeeshwaram. It is not simply taking water from Palavi and pouring over the Maha Lingam. It is performed with devotion and in keeping with the seven requirements laid down, saying "Let us all gather to anoint Him who had been distressed and in that process wash our sins away". from the presentation of the Kalakshetra dance drama "Pancha Ishwaram of Lanka" at the University of London on 16 October 1999. Shri S. Arumugam was born in Nallur, Jaffna. He obtained a Science Degree from the University College, Ceylon in 1928 and then proceeded to Kings College, London, UK, where he obtained a Degree in Civil Engineering in 1931. After graduating, he worked for the Manchester City water supply works, and then returned to Sri Lanka in 1933 where he joined the Irrigation Department and finally retired as Deputy Director in 1965. His work in the Irrigation Department required him to travel widely in Sri Lanka, and this gave him the opportunity to study about the ancient Hindu temples in all parts of the country. He has also studied Hindu temples in India during his several visits. Apart from his technical publications (he was President of the Institution of Engineers, Sri Lanka) his published works connected with temples include "Some Ancient Hindu Temples of Sri Lanka (1980), "The Lord of Thiruketheeshwaram"(1981), "Thiru Koneshwaram" (1990), "Stone Scupitures in Colombo Hindu Temple" (1990) etc.